James Mogridge won yesterday’s (January 10) Frostbite League race at March - the fourth in the six-race series. 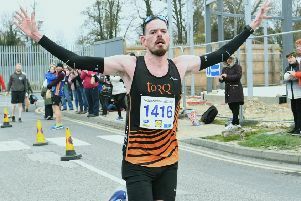 The Yaxley Joggers runner completed the course in 29.00 to finish 18 seconds clear of PACTRAC’s Paul Vernon, who had won the previous two races in the series. Lloyd Kempson of Nene Valley Harriers was third in 29.29 with Paul Halford of Werrington Joggers fourth on 29.48. First female finisher was Claire Somerton of Cambridge & Coleridge in 47th place. Her time was 33.59. Joey Croft of Hunts AC won the junior race in 8.08 followed by PACTRAC’s Jonathan Oakey (8.42) and Eye’s Isaac Ellard (8.45).